A: August 28, 1933 in Kennett, Missouri. Q: What is your current address? A: I live at 7862 E. Main St in Kalamazoo with my husband. Q: How long have you lived in Kalamazoo? A: Since 1939, except for three years in Flint from 1960 to 1963. Q: When were you married? A: I married Carl Betz, my first and only marriage, on September 13, 1952. Q: You have a fifty year anniversary coming up? Q: Do you have any brothers and sisters, and when were they born? A: One deceased brother, who would be 76, two brothers died in infancy, another brother age 58, and four sisters, ages 71, 66, 51 and 49. Q: In what towns or states do your brother and sisters live? A: They all live in the Kalamazoo area. Q: Where did your brother who died live? Q: When did your brother die and did any of your family go to his funeral? A: He died on February 2, 1994 and aU of my sisters and my other brother went to his funeral in Florida. Q: How old was your father when you were born? Q: What was your father’s education and occupation? A: My birth certificate lists his occupation as farmer. He had an elementary school education. He was born in Arkansas. He died at age 73. Q: Did you ever see your father farm? Q: What work were you aware of your father doing? A: Factory work. He retired from the paper mill. Q: What paper mill was that? Q: How long did he work at that paper mill? Q: Do you know what he did at the paper mill and if he always did the same thing or did it change over time? A: Worked his way up to beater engineer. Q: What did your father die of? A: He had a heart problem, he went to Missouri by himself to see relatives, forgot his heart medication and died in Missouri. Q: What about your mother? A: She was 25 at my birth. She had a sixth grade education She had 12 sisters and brothers, she was born in Texas. Her name was Annie Cadle Psalmonds. Q: Did your mother work? Q: How 9ld was your mother when she died? A: She died at age 51. Q: Where were you living when your mother died? A: Flint, Michigan. I was 26, married and had a three year old girl. Q: Who raised the children after your mother died? A: Four of us were grown and at home was a 7, 9, and 16 year old that father raised. Q: What did your mother die of? A: Colon cancer, which was the same thing my older brother Buel died of, they both died on February 2nd. Q: Did you ever have a stepmother? Q: What else can you tell me about your mother? A: She was only 15 when she married, but the marriage certificate says she was 18. She was 17 when she had my brother. Q: Do you have any information about your grandparents? A: I never knew any grandparents. Both grandmothers died young. I have photos of my maternal grandmother, Viola Cole Cadle. Q: What type of house did you grow up in? A: We moved frequently. The four oldest children were born in four different states. A tornado destroyed the first home I remember living in in 1938. With the help of the Red Cross we moved into a box car in the middle of a cotton field and picked cotton. We came by truck to Keeler with other families and picked strawberries in 1939. We stayed in an old stable, with bare dirt floor, sleeping on cardboard and later straw. From there we moved to an apartment in Kalamazoo and my dad worked at lngersolls, a war-factory. We continued to move- country, city, small towns. Q: How many and what states did you live in? A: Three: Missouri, Arkansas and Michigan. Q: Who did the housework’? A: My mother did all the housework My dad did not help with the children or housework. When we lived in the box car she washed clothes in the yard with a tub with a washboard. She made soap from lye and she made dresses from flour sacks by hand with no patterns. Q: What other kinds of housework do you recall seeing your mother do? A: She shoveled coal into the furnace. Heated water on stove to wash clothes and dishes. Q: Did you ever have a garden? A: At one house on 26th Street in Comstock my mother had a small garden with lettuce and vegetables. Q: What kind of a man was your father? A: Hard working, very honest, but indifferent. Q: What do you mean by “indifferent”? A: He didn’t seem aware of us at times. He forgot our names, He didn’t seem to notice how hard it was for mother. Q: Did he go to church? Q: Did your mother go to church? Q: Did you have any modern conveniences? A: We had no modern conveniences at the box car. In the Kalamazoo apartment we shared a bathroom with other tenants. When I was 12 we settled in a house with a pump in the kitchen and toilet in the closet. It was a very small house, with a coal furnace with one register. Mom washed the clothes with a wringer washer and in the winter freeze dried them on the line until I bought her a dryer. I helped my mother with child care and cleaning. She had a baby when I was sixteen and another when I was nineteen. She sang old country gospel songs while she worked. Q: Did your father play with you as a child? A: No. Not that I recall. Q: Did he ever just throw a ball and play catch with any of the children that you know of? A: Not that I know of. But that wasn’t unusual in those days. Q: Did they ever laugh and smile, your parents? A: My mother sang a lot. My dad could be funny at times, but he was a complainer. I saw my dad in a good mood twice, laughing and singing- but he was drunk. A: No, she was too busy. I don’t believe parents did that then. Q: Did your parents watch you, and if one parent was gone, would the other watch the children? A: Dad seemed concerned if we were sick, which was often. We had measles, whooping cough, and mumps. Q: Did you ever see your father do any household work? Q: Who took care of the house after your mother died? A: It fell into disarray. Q: Who disciplined the children? Q: What type of discipline was used? A: Tap with flyswatter or switch; mostly nagging. Q: Who bathed and dressed the children? Q: How did you get water, from a faucet, or some other way? A: Eventually from a faucet in kitchen. There was none in closet where toilet was. Q: How old were you when you first got water from a faucet? A: I think about 13. Q: Did you always have electricity that you can remember? A: No. Not in Missouri and not in the migrant camp in Keeler. Q: How old were you when you first had electricity? A: When I was about six and we moved into an apartment in Kalamazoo. Q: What did you do before you had electricity? A: We had kerosene lamps and stove in Missouri. When we stayed in the migrant camp at Keeler, I fell in the dark on my nose. All we had for light was a match. I still have the scars. Q: Did you ever go to a movie theater as a child? If you did, what types of movies did you see and what theaters did you go to? A: When I was older I went to movies. Mostly cowboy or Superman at Uptown theater in Kalamazoo. Q: As a child did you ever go on a vacation? A: We could not afford vacations. We did not always have a car. Q: Did either of your parents read to you? A: No. I recall my mother reading to my younger sister who is now 66 and my brother who is 58. Q: Could your parents read? Or how good could they read? Could they read the newspaper and what did they read? A: They could read and write very well. They always read the newspaper. Q: Who shopped for food and prepared meals? Q: Where did your mother shop for food? A: Reeds market in Comstock. There were no big supermarkets or malls then. Q: What kinds of meals did you usually have? A: We ate mostly homemade biscuits with milk gravy and beans and cornbread. Q: Any special dishes you remember? Q: How did you learn how to cook? Q: Was your mother an easy person to talk to? A: Mother was gentle and ladylike. Q: Did your mother show affection? A: I thought caring for us was affection enough. Q: Could you share your worries with your mother? Q: What kind of person do you think your parents hoped you would grow up to be? A: They did not express any desires. Q: But what did you think they hoped you would grow up to be, whether they expressed it to you or not? A: I think my mother secretly admired my independent ways and would have approved of me enlisting in the WACS. I don’t know about my dad. Q: What things did your parents raise you to believe were important in life? A: Honesty was important to them. Q: What activities outside the home did your mother enjoy? A: Mother had no outside activities. Q: Did she have any hobbies? Q: Did anyone in your family play a musical instrument? Q: Did you ever see your mother pru1icipate in activities outside the home? A: No. Parents did not attend school functions like they do today. Q: Did your mother have her own friends? A: No, she had no friends of her own. But she enjoyed visits from her sisters. Q: What games did you play as a child? A: We played games that did not cost anything, such as tag, kick the can, jax, jump rope, checkers. Softball was the favorite neighborhood game. Q: Did boys and girls play the same kind of games? A: Boys and girls played sports together. Q: Did boys and girls play together? A: Boys did not play with dolls. Q: What schools did you go to? Q: What city school was that, in what city? A: Harding and Edison in Kalamazoo. Washington in Battle Creek. Q: Where was the one room school at? Q: Where was the 7th Day Adventist school? A: I was the first in our family to graduate from high school, in 1952. My husband graduated in 1951, we both went to Comstock High School in Kalamazoo County. Q: What goals did your family have for your education? A: My parents never talked of goals. I think they wanted me to finish high school. Q: What goals did you have as a young person? A: I wanted a better life than my mother had and I wanted to make her life better. Q: Did you plan to work after high school? A: Yes, I had no choice. Q: What work have you done and when? A: I worked all through school in a private bottle club, cleaning and washing dishes. Also as a car hop in my senior year. I worked for five years in a office after graduating while my husband was in the Navy and while he went to Western Michigan University. When I got pregnant I had to stop working at three months, that was the law or rule then. I worked evenings during his senior year at WMU. I worked when my children were old enough, working at WMU to help pay for their college and support their endeavors. My goals were to help my children which were achieved. Q: When did you work at WMU? A: I began at age 45 in 1978 until I retired in 1995 at age 62. My second grandson was born six months later. I still care for him a lot, and did for his older brother as well. Q: What is a private bottle club? A: It’s a high class bar where people bring their own alcohol. Q: Where was this club and what was its name? A: It was near my home in Comstock and was called the Homestead. Q: Do you recall about when they went out of business, or did the business change it’s name? Q: Where was the car hop and do you remember its name? A: The Iceberg was the -first car hop in Kalamazoo on Portage Street across from the airport. Q: When you say that was the rule or the law that you couldn’t work after being three months pregnant, who told you that? A: It was general knowledge and did not change until a female teacher took it to the Supreme Court. Q: Was this a law of Michigan that you are referring to? Q: Was this a teacher in Michigan who took it to court, and do you mean the Supreme Court of Michigan, another state, or of the U.S.? A: It was the U.S. Supreme Court. I do not know where or when the teacher taught. Q: How and when did you become aware of this court case? Q: Was it assumed that a woman would quit or was it that they would be fired from any job after three months of pregnancy? A: It was assumed they would be fired. Q: Would the woman be allowed to go back to work after a certain period of time after having a child or not? A: She would have to reapply. Q: Were women kept from certain jobs if they were married, or if they had children at all, and if so, what jobs? Q: What were your goals for working? A: I used the money to buy clothes, lunches, tennis racquet, tennis shoes, a trip to the dentist I had no goals other than to somehow have a better life. Q: Did you achieve your goals to your satisfaction? A: As far as assisting my children, yes, and that was my main goal. Q: How old were you when you were married? A: I was 19. I didn’t see anything else. Q: What was your idea of what marriage should be? Q: Did you have a romantic image of what married life would be like? Q: Was the reality of marriage like your image of marriage? A: The reality was worse because I hadn’t considered in-Jaws. Q: What advice would you give a young person just starting out in marriage? A: I don’t believe young people listen to advice. Q: Did you plan to have children? Q: Was birth control information and products available when your first had children and if so how easily available? A: No, it was taboo to discuss this. My doctor put me on birth control pills after a serious operation. I believe they were Upjohn pills not on the market yet They made me sick constantly. A: Three, ages 45 girl, 41 boy and 37 girl. Q: How old were you when your first child was born? A: I had babies at age 24, 27, and 31. Q: Did you know what to expect of carrying and having a baby? A: From my experience having children was a burden and kept you mired in poverty, as my mother and grandmother were. Q: What were the birth experiences like? Q: Did a doctor or nurse give you much information about what the birth experience would be like and what procedures or medications were available? Q: Did you have medication, or natural child birth or something else? A: It was very painful and I had medication. Q: Did anyone help at home after you had the children? A: Only my husband when possible. Q: Did you breast feed or bottle feed your children? Q: What was encouraged for feeding babies? A: Nothing that I can recall. Q: Did you use contraception? A: After my last child, my husband had a vasectomy. A woman had to have at least four children to get her tubes tied and she still had to see a psychiatrist for approval and have her husband’s approval before her doctor would allow it, so we went with the vasectomy. Q: The husband did not need anyone’s approval for the vasectomy? A: I gave my approval, but I don’t know it was required. Q: Was a woman considered to be her husband’s property to some extent? Q: Do you remember World War II? A: I was in Flint at the end of WWII. Suddenly the whole town came alive, cars honking, bells ringing, people yelling. Everyone came home from work and gathered in the center of town and celebrated. Q: Any other events stand out? A: Franklin Roosevelt’s death was shocking. He was the only President I ever knew and my parents idolized him. I remember Joe Louis fights on the radio. We had no TV until I was in high school. The shooting of President Kennedy was horrible. Martin Luther King’s death. Q: Do you remember where you were when JFK was killed? A: I was home at 197 Homer Street in Comstock, watching Walter Cronkite on TV. Q: What about Pearl Harbor? Q: What about the Korean War? A: I was in high school in 1951 and my future husband was in the Navy, but he did not see action. Q: What do you recall of the Vietnam War? A: Much confusion and protesting. Johnson did not run for re-election. Q: What about the Civil Rights movement? A: I was rooting for Martin Luther King. I was very frightened to see Blacks attacked with hoses and dogs. Q: Were you involved in anything with the Civil Rights movement? A: I had small children and was tied down, no. Q: How did you first become aware of the women’s liberation movement? Q: Did you read.that when it first came out, and how did you get a copy of it, at the library or buy it? A: At the library. I read it in the late 60’s. Q: What did you get out of “The Feminine Mystique”? A: That I was not alone in my frustration. Q: Were you involved in women’s rights? Q: What was your first involvement in the women’s movement? A: Heading a county effort to secure signatures on petitions for a voters’ referendum to change Michigan law on abortion. My crew and I collected 12,000 signatures, it went on the ballot in 1972 and was defeated. A: In 1972 I was a precinct delegate committed to electing Shirley Chisolm to the presidency. We arranged for her to visit Kalamazoo and she spoke in Bronson Park and then we drove to Battle Creek and visited Sojourner Truth’s gravesite. Q: Did you drive with Shirley Chisolm? A: No, there was a caravan. Q: What other things can you remember? A: I was also treasurer for Mary Brown when she first ran for election to the State House. She won the primary, but lost in her first attempt. I also worked for Paul Todd to win the U.S. Representative’s seat. In 1971 I formed a NOW chapter in Kalamazoo; meetings were held at the YWCA. In 1971 Jo Jacobs, a leader in the movement, who is now in the Michigan Women’s Hall of Fame, was conducting a study of KPS textbooks for sexism. I made a small contribution to that study. Q: What was your contribution to that study? A: I read a textbook and noted sexist statements. Q: About how many members of NOW were there in Kalamazoo when it started? A: It took ten people to form a NOW chapter. When the first meeting was. announced many came, even one man. I think we eventually had approximately fifty members. Q: What issues was the movement looking at? 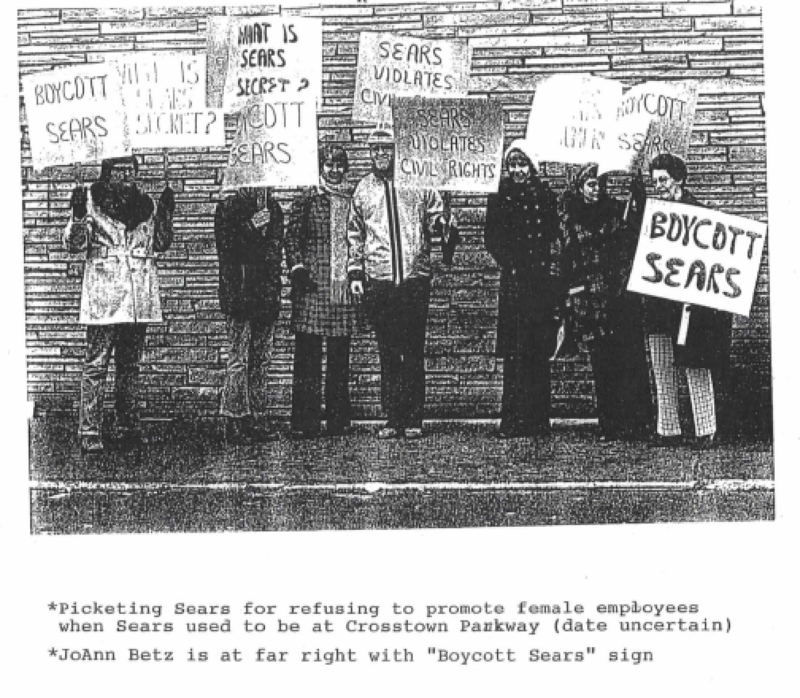 A: In the 70’s the Kalamazoo Gazette was still listing jobs under separate headings for men and women. The movement ended that practice. The Gazette also began including men in wedding and engagement photos. Q: Any other changes you remember? A: TV channel 3 hired its first female newscaster. Q: Was the movement affected by Roe v. Wade, the 1973 decision on abortion? A: In 1973 when that came out, it was possible for women to get an abortion. I served on the first Board of Directors of Alternatives, an abortion clinic. We hired the director through my network of people in the state who worked on the referendum. I also served on the Planned. Parenthood, YWCA, and Kalamazoo Democratic Party Boards. Also, the Kalamazoo Human Services Commission. At a NOW meeting, I brought up the need to investigate spousal abuse in our county. NOW President Karla Atkinson, who is in the K-College Sports Hall of Fame for tennis, and I visited Phil Crammer, Professor of Social Work at WMU. He agreed to having a group of masters students do research on the subject of spousal abuse. Their study found that 10°/o of households have spousal abuse. We took this information, wrote a proposal, and asked for a grant to open a shelter. We were turned down. We then formed a committee of the prosecuting attorney, various social services organizations. They submitted a proposal and it was accepted. I brought two women to the shelter at the YWCA before it officially opened. Q: What else do you remember? A: In 1978 I took my two daughters to Washington, D.C. and we marched for the ERA. Q: What persons have you met in the movement? A: I have met Gloria Steinem, Betty Friedan at a NOW conference in Philadelphia. Bella Abzug, Shirley Chisolm, Lorraine Beebe who lives in Portage. Helen Milliken at the Governor’s home. Q: Where did you see Gloria Steinem? A: She spoke at the Radisson, we each paid $100 which was donated to keep abortion legal. Q: You saw Betty Friedan in Philadelphia? A: There was a NOW convention and Betty Friedan was being snubbed due to a power struggle. I don’t know why. To me she was the mother of the movement A group of us sitting near the speakers stand began clapping and chanting “we want Betty”. She appeared and gave a powerful speech. Q: Where did you see Bella Abzug? A: Bella Abzug was known for her hats; she spoke to a group of us in Lansing. I don’t recall what for. She always sounded as if she were speaking at a pep rally. Q: What do you recall of Shirley Chisolm? A: When she came to speak in Kalamazoo she also spoke in Spanish. She was very intelligent. Q: How did Governor Milliken’s wife, Helen Milliken fit in? A: She was very concerned about the environment and population growth. A group of us were invited to the Governor’s home in Lansing. Governor Milliken greeted us at the door. Knowing the majority of us were Democrats she asked us how many would be willing to vote for her husband. There were two union women from Battle Creek who said they never could vote Republican. Q: What was your husband’s attitude about women’s rights or the women’s movement? Q: What were the goals of the movement in Kalamazoo? A: My generation had been socialized to live a certain way and we were denied opportunities. Goals were many, to change textbooks, found an abortion clinic, a shelter for abused women. Q: Are you still involved in the women’s movement? Q: To your knowledge, is there a women’s movement in Kalamazoo today? Q: What happened to decrease your involvement? A: Many people have died or are elderly. Q: Do you believe women born today are better off than when you were a child? A: They have more choices; they can support themselves financially. Q: In what ways were women limited by socialization? A: Women were taught by textbooks their place, their goal was to marry and adjust to their husbands thinking and lifestyles. I was told by my male doctor that my place was not in the workforce. There weren’t female doctors, minister, newscasters, dentists. Q: Were there things you wanted to do that you thought society wouldn’t want a woman to do? A: I moved into an apartment with two girls after graduating and was made to feel it was sinful by my dad. I wanted to join the WACS, but was discouraged by those I told. My in-laws thought it was disgraceful that I drove to Norfolk, Virginia by myself. Q: Who was a woman that you looked up to as a child? A: Superwoman in the comic books. Q: Who was a woman that you looked up to as a young adult? A: The greatest female athlete, Babe Didrickson. Q: What women did you look up to as you grew older? Q: Were many of the people in the local women’s movement also involved in the Civil Rights movement? A: No, but most had small children like myself, but they supported civil rights. Q: Do you still keep in touch with any of the women you met or worked with in the women’s movement? A: Most are deceased. I keep in touch with a few. One who was my best worker in collecting signatures for the abortion referendum is in her nineties. Another is 87 and one who was a WASP in WWIT is 83.